For Henry William Thompson the South Australian politician, see Henry W. Thompson (politician). Henry William "Hank" Thompson (September 3, 1925 – November 6, 2007) was an American country music entertainer whose career spanned seven decades. The 1987 novel Crazy Heart by Thomas Cobb was inspired by Thompson's life, specifically by his practice of picking up a local band to back him when he toured. In 2009 Cobb's novel was turned into a successful film directed by Scott Cooper and starring Academy Award winner Jeff Bridges. Born in Waco, Texas, Thompson was interested in music from an early age and won several amateur harmonica contests. He decided to pursue his musical talent after serving in the United States Navy in World War II as a radioman and studying electrical engineering at Princeton University before his discharge. He had intended to continue those studies on the GI Bill following his 1946 discharge and return to Waco. Later that year, after having a regional hit with his first single was "Whoa Sailor" for Blue Bonnet Records, he chose to pursue a full-time musical career. 1952 brought his first No. 1 single, "The Wild Side of Life," which contained the memorable line "I didn't know God made honky-tonk angels" (which inspired songwriter J.D. Miller to write the answer song, "It Wasn't God Who Made Honky Tonk Angels") which became the first hit single for pioneer female country vocalist Kitty Wells. Other hits followed in quick succession in the 1950s and 1960s. Thompson began singing in a plaintive honky tonk style similar to that of Ernest Tubb but desiring to secure more engagements in the dance halls of the Southwest, reconfigured his band, the Brazos Valley Boys, to play a "light" version of the Western swing sound that Bob Wills and others made famous, emphasizing the dance beat and meticulous arrangements. From 1947 to 1965, he recorded for Capitol Records, then joined Warner Bros. Records, where he remained from 1966 through 1967. From 1968 through 1980, he recorded for Dot Records and its successors, ABC Dot and MCA Records. 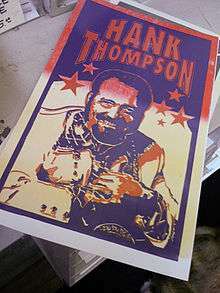 In 1997, Thompson released Hank Thompson and Friends, a collection of solo tracks and duets with some of country music's most popular performers. In 2000, he released a new album, Seven Decades, on the Hightone label. The title reflected his recording history during the 1940s, 1950s, 1960s, 1970s, 1980s, 1990s, and 2000s. Thompson was elected to the Country Music Hall of Fame in 1989 and was inducted into the Nashville Songwriters Hall of Fame in 1997. He continued touring throughout the U.S. until shortly before he became ill. Often, he worked with a reconstituted version of the Brazos Valley Boys that included a few original members. Thompson's last public performance had been on October 8, 2007 in his birthplace of Waco, Texas. Like many men of his generation, Thompson had been a smoker for most of his adult life, and had been admitted into a Texas hospital in mid-October for shortness of breath. After having been diagnosed with a particularly aggressive form of lung cancer, Thompson canceled the rest of his 2007 "Sunset Tour" on November 1, 2007, two days after being released, and retired from singing. He then went into hospice care at his home in Keller, Texas and lost his battle with the disease five days later on November 6, 2007, aged eighty-two. According to his spokesman Tracy Pitcox, also president of Heart of Texas Records, Thompson requested that no funeral be held. On November 14, a "celebration of life," open to both fans and friends, took place at Billy Bob's Texas, a Fort Worth, Texas country and Western nightclub that bills itself as The World's Largest Honky Tonk. ↑ Cobb, Thomas (1987). Crazy Heart. San Francisco: Harper & Row. ISBN 0-06-015803-4. ↑ Lewis, Randy (2009-12-28). "Hank Thompson: 'Crazy Heart's' real-life Bad Blake". Los Angeles Times. Retrieved 2011-04-04. ↑ Whitburn, Joel (2011). Top Pop Singles 1955–2010. Record Research, Inc. p. 893. ISBN 0-89820-188-8.